Time flies by lately. The other day I realized that 18 years have gone by since I first saw Highland dancers at a local pipe band performance. During that time I have met many wonderful and sometimes not so wonderful people. I can fully sympathize with the situation Katherine Austin referred to in her column (Dancer) a few months ago; "being a great giver does not always mean that the people whom you are hoping to help are gracious receivers". People can sometimes be very cruel and uncaring. Throughout the 18 years (to date) I have heard many respected dancers and teachers refer to the talent of certain individuals. When I have been able, I have tried to contact and profile these dancers. It hasn't always been easy. Roadblocks have sometimes been put in the way because the individual didn't belong to one group or another. One name was frequently mentioned. Not surprising, except that this particular name was mentioned in more than one country, USA, Canada, New Zealand, Australia, Scotland and South Africa. All groups had a great deal of respect for the individual and his dancing ability. Peter or Pete as he prefers, graciously agreed to an interview for DANCER One of the very first things you notice about "Pete" is his sense of humour and humility. Pete was rather surprised to learn of all the kind and flattering observations that had been directed to him both as a person and as a dancer. " I started dancing in New Zealand at the age of 4 or 5. 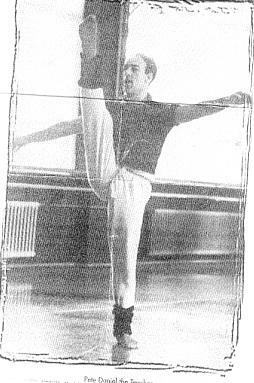 I first started off with Highland, ballet, tap with Leona Robinson. NZ. We moved quite a lot so I had a few good teachers. I really wasn't very good"
Pete nearly quit dancing when he was a teenage. "I used to win mediocre things. Then someone I knew since childhood, (she could see what was happening to me); I was doing that teenage thing where you want to quit. She said to me that if I went to her for classes, she would make me a champion within a year. She did! I had to work really hard. To get to classes, I had to go by airplane, hitchhiking or in my father's hearse!! Her name was Tui Downie and she was like my 2nd mum"
Pete had a dream to travel and to eventually go to Scotland. At the age of 18 he became a professional dancer with a TV show in New Zealand. "I actually traveled and competed at Highland Games throughout Australia, Canada, USA, and eventually Scotland. In answer to "Dancer's" question with regard to his most satisfying moment in Highland, Pete responded: "Actually, it was kind of neat to win, and I didn't always win you know! But, the most satisfying thing was the fact that I went through the world and I met probably the best Highland dancers of that time. I was thrilled just trying to keep up with them. OK! Sometimes I beat them and sometimes they beat me, but it was a thrill!" Not all of Pete's experiences with Highland were thrilling. He had danced in many games and won championships in New Zealand and Australia and because of this " there was a heavy duty Meeting called in Scotland as to whether they were going to let me dance. I was rather young and naïve and had to argue my case that there were at least four other dancers who had also competed. So they (SOBHD) did let me dance but it was off-putting to go through that right before a championship. Still I did fairly well." It is to his teacher Tui Downie that Pete gives accolades, "Yes, she was a hard task master and I had to work really hard. She is a brilliant teacher, the best! What was great, the other people in my school were also very good. We were always taught (which I think is incredible) to never resent each other, to always praise one another. When you were at a competition never to be over excited when you won, never to show disappointment when you lose because, obviously, you are not going to win all the time! Competitions were pretty much the same all over the world, except maybe one difference is that in Scotland you danced in the rain. Of course SOBHD dancers were not allowed to dance in the non-board competitions in South Africa, New Zealand, Australia and Scotland etc. I danced in all these non Board games. I did the steps that I had learned in New Zealand and at Board competitions. I would change and do the "required steps". I remember once just for fun really learning the "required steps" for Cowal (SOBHD World Championships) at three in the morning. We danced at nine a.m. but it was really just for fun. I found that fairly easy to do because the basics were all in place. If you are properly trained you can change the steps. The problem is internationally the "base" is gone. Some of the real old good dancers that had a really good base are no longer with us. The basics and training have suffered"
To the question of the lack of males dancing Highland (whereas it was a totally male dominated competition at one time) Pete thoughts reflected what most male dancers have to deal with. "Peer Pressure". "When I was a kid I was always in the newspaper (for dancing) and the kids at school would say "sissy! When actually it wasn't at all "sissy" because it was very hard work! It wasn't until later that my school friends actually apologized for what they had said. My school (studio) now has a lot of boys signing up but that is of course for "Tap!" I don't teach Highland here in Switzerland, as quite frankly they don't know what it is. I have tried on several occasions to start but there just isn't the interest. The Swiss are interested in classical, modern, tap and jazz. They actually have a very high standard and the dancers do very well professionally. Pete has also done very well professionally after leaving Highland, so to speak. He went into "show business" which is not an easy profession. "I was a dancer and also a choreographer all over the world" Pete has also passed adjudicators exams and written examination syllabus (used throughout Australia, New Zealand and Europe for Ballet Australia) However I am not allowed to judge Highland in Scotland, (SOBHD) and I find that really funny" he said with a laugh! "It was a shock to me to find out that people respected my dancing. I hadn't realized that people still mentioned me until a few years ago. It was nothing to do with the actual "form" of Highland dance. I think it was more to do with the fact that I was highly trained and I did stuff (with much laughter interspersed in the following) that I can't do now! I did what other dancers were doing. I didn't do anything different, it was probably the technique. " 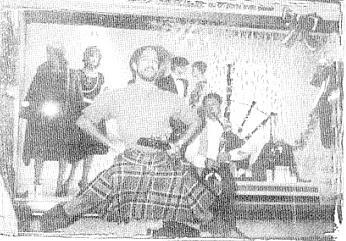 The really great thing about Highland I remember, when I was doing the games all over the world I met some really great dancers and they became my very good friends. We never had problems. We competed against each other and thrived off of one another. The thing that is happening now in most forms of dance, as well as Highland, is that many people had good technique but they don't really dance! I think in my day we had good technique but we always danced from ourhearts! You may contact Pete Daniel who is teaching in Switzerland. 28, Rue des Bossons, CH-1213 Onex, Suisse.